This is a Sponsored post written by me on behalf of Insurance Hunter for SocialSpark. All opinions are 100% mine. Well school's back in for the fall and with moving our kids are learning all new routines and expectations. One thing we quickly discovered is that people do not respect school zones and drop off locations. Even with reduced speed limits in school zones I see speeding drivers flying by every day when I am dropping off the kids at school. I recently read the Insurance Hunter’s survey on driver safety in school zones and discovered that many facts say the same thing. The survey shares that over 66percent of parents drive their children to school which certainly adds to the congestion and confusion around drop off times at school zones. I can certainly understand the results from the survey that states 38 percent of parents have not recieved information from their childrens school regarding drop off/pick up proceedures and locations. We were new this year and there was no information sent home with all the forms and paperwork not one mention of the proceedures. I really found the Ontario School Zone Safety Survey rang so true with our family it seemed to be so accurate and I encourage you to check out the results for yourself and see how the results compare to your families experiences. If you are currently looking for information on insurance programs and options for your auto insurance needs you can review the Insurance Hunters website to get online comparisons on home, auto, travel and more quickly and have your quote followed up with a qualified insurance broker to ensure you have the best insurance options for you and your families needs. I am happy to say that with all the fun I am having in the blogging world, I decided it was time to get another blog on the go. Those of you who already know me know that I always have something to say. I talk and talk alot. This is a blog where we can share ideas and comments while having fun along the way. 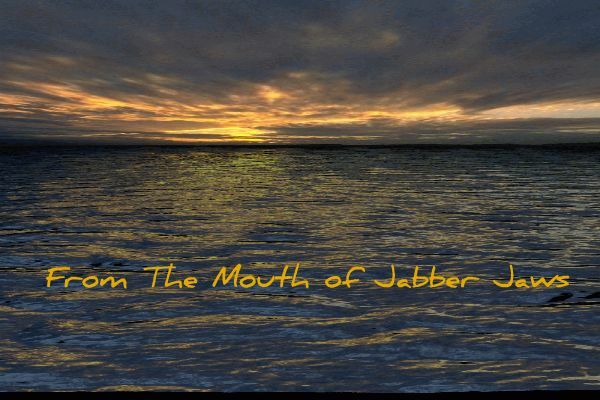 I hope you enjoy your visit here and remember to check in to see what "Jabber Jaws" has to say!